We were browsing the George Nelson archive and found this amazing Petal clock which, according to the George Nelson archive, was made by Howard Miller in 1964 and retailed at that time for only $15.95 . 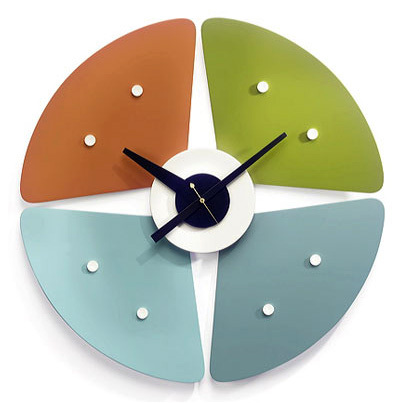 The clock is now back in production through Vitra from Germany at an inflation adjusted retail price of $275.00 which is still not a bad deal I guess. The George Nelson Petal clock measures 18" in diameter. Free research on the following: information about the George Nelson Biography, learn about the history of George Nelson Associates, info on Authorship such as who designed what, an interesting production Time Line, original George Nelson Quotes , Production and Historic Facts of Interest, Original Vintage Advertising, information on Howard Miller and Herman Miller, answers to commonly asked questions, the connection with Charles and Ray Eames, a wonderful collection of Howard Miller Clocks, the new line of Vitra Clocks, as well as the complete product line including lighting, furniture, art and more. The George Nelson Archive welcomes any additional information that can be added.